Actual size: 19 3/4" x 24 1/4" x 4 7/8"
This Aprilaire 213 High Efficiency Air Cleaner 20x25x4 MERV 13 will help improve your home's air quality, reducing the amount of airborne allergens and dust particles in the air. This quality product is only available for purchase online. 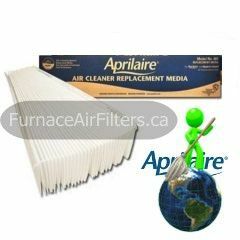 Add Aprilaire 213 High Efficiency Air Cleaner to your cart and it will be on its way to you shortly.